During our honeymoon, we took a few side trips to explore more of the area. In between Charleston and Savannah, we stopped to check out a massive tree. 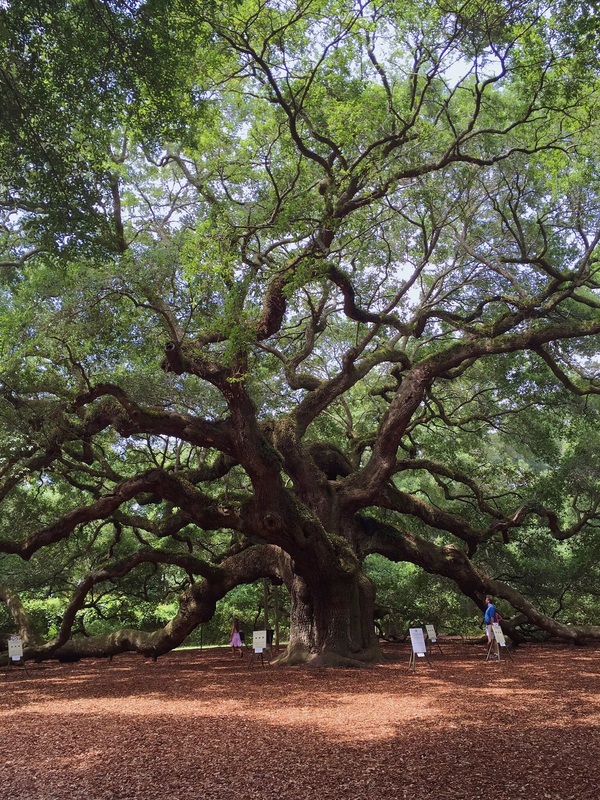 Located on Johns Island is a tremendously old oak tree called the Angel Oak Tree. We were told to stop by to check out this insanely old tree. We were definitely in awe as we walked up to the tree. Standing beneath the tree, we fell silent as we looked up at the massive limbs twisting above us. For a little background on the tree, it is over 1500 years with a height of 65 feet and a circumference of 25.5 feet. Many of the limbs are so massive that they are supported by wires and beams so that they do not completely collapse. We snapped a few pictures, but pictures don't really do this old tree justice. The only way to understand how breathtaking this tree is, is to experience it yourself. A day trip to the Angel Oak Tree is a must if you find yourself near Charleston, or a good pit stop between Savannah and Charleston. While on Fripp Island, we decided to explore the town of Beaufort, a historic town in South Carolina's low country. Beaufort is the second oldest town in South Carolina. I had heard that a lot of filming for the movie, Forrest Gump, had taken place in and around Beaufort and wanted to go check out its picturesque views. While driving to Beaufort, we enjoyed the beautiful scenery. The drive was relaxing and picturesque. Once we arrived in town, we noticed that there were people everywhere and that there was a big festival going on. Although we did not attend the festival, we enjoyed walking around and looking at the view the town had of the surrounding water. On our way out of town, we noticed that the houses in Beaufort were incredible. We drove around for about a half hour looking at the unique, old homes that all boast antebellum character and architecture. We stumbled across some amazing properties that must be visited in person. Anyone interested in old homes, beautiful scenery, and lots of history would love a trip to Beaufort, South Carolina.